If you have carport plans but don't know what you're doing, have no fear, we're here to help you learn how to build a carport on your own. Building a carport is actually a simple project if you have the right tools, time, and a little patience. The really tough part is deciding where to put it. Don't forget to locate your utilities both for use in your carport and to be sure you don't strike a line when digging. But, what about the building part? If you have a set of carport plans staring you in the face and you're not quite sure what to do with them, then you're in the right place. In this article, we're breaking down how to put a carport together for Do It Yourselfers. Keep reading to learn more. Building a carport can extend the life of your vehicle which might save you some money in the long run. Not to mention that it can protect you from the elements when you're leaving and entering your house. That's why many homeowners build carports. Follow in their footsteps and build your own following these steps. Besides the protection it offers, a carport can also increase your property value. For this reason, you must obtain the proper permits from your local municipality prior to building. You'll need proof of ownership of your property, provide permit application worksheets from the city, and your construction drawings in order to clear a permit. Depending on the type of carport you intend to build will also depend on the type of tools you need. Make sure you have a complete list of tools necessary for the job ahead of time. You may need to rent some tools that you don't regularly use at home. Wood carports and plans usually come with wood carport kits that detail all of the necessary building materials you'll need. Galvanized metal carports, though quicker and easier to install are less sturdy 'out of the box' and may require additional materials. For wood carports, consider using pressure-treated lumber for longevity and durability. Your carport designs should provide measurements of at least 16 x 9 for a standard car. If you are housing a truck or SUV, your measurements will be wider and longer. If your ground is not already bare, you'll need to remove grass and rake the ground layer with a metal rake. You may also stomp your feet while you rake to achieve a more level appearance. Whether you plan to pour concrete or not, you'll still need groundcover rocks. Crushed granite is generally recommended. You'll need to dig post holes for all of your posts at least four feet apart and four feet deep. You will be using heavy-duty posts that are at least nine and eleven feet high. Next, you'll need to pour concrete into the holes. Do this one at a time so that the concrete doesn't set while you're placing your posts. Pour concrete up to two feet deep in the hole and set your post before filling the rest. You can use a level to make adjustments to the concrete as it dries to ensure that the post remains completely vertical. Allow the concrete to set for at least one day before proceeding to the next steps. Once your posts are set, you can fasten the beams to begin the structure of the roof. First, secure the sides making sure that they are level. Next, you can fasten the side beams with the roof beams. Simply nail your crossbeams across. Make sure your beams will meet specifications for load bearing weight, especially if you live in a snow-prone area. They should be at least two feet apart and across. Once your beams are set, you may begin applying the plywood roof boards to the rafters. You should allow for a six-inch overhang on the front and back of the carport. The roof surface for a standard car will be 10 feet by 17 feet so make sure you have enough plywood. You should use 1/2 inch plywood for this project. Once the roof is on, your carport should be sturdy and solid. If there is movement in your structure, you'll need to tear the roof off and start back at square one. Otherwise, you can affix the rest of the roofing. Don't forget to caulk the plywood roof seams before laying your shingles. You're almost done. In order to ensure the stability of your carport, it can't hurt to reinforce the joints with metal plates where the structure meets. At the beams and corners, most specifically. Even though you're using pressure-treated wood, it's a good idea to paint or stain your structure to preserve the life of the wood and protect it from insects like termites. Proper maintenance and timely repairs will also preserve the life of your new carport. Consider re-staining or painting at least every two to three years. 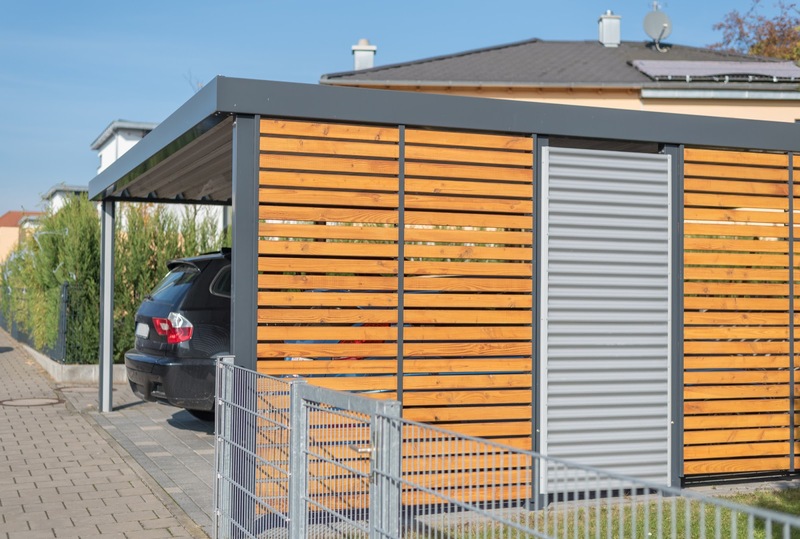 If these carport ideas are just too much to handle, then you might consider building a PreFab carport instead. You can find buildings like this at https://metalportablebuildings.com/. It's a big financial decision to build a carport. But it can offer a lifetime of benefits. These carport plans should be enough to get you started on your own DIY carport. Just as with any home improvement project, the trick is to measure twice and 'build' once. Don't get ahead of yourself with the steps. Take your time and get it done right the first time. This project requires spending a lot of hours outside. Don't forget to drink plenty of water, especially if it's hot and sunny. Here's some helpful advice to help you get your daily intake.